We have a thing for Buffalo sauce around here. It’s not something I crave everyday like coffee or cheese, but when the mood strikes it is intense! I have found many ways to satisfy that craving, from frying chicken and drenching it in tangy Buffalo sauce or keeping it simple and making a hot and cheesy dip inspired by the combination of Buffalo sauce, chicken and cheese. 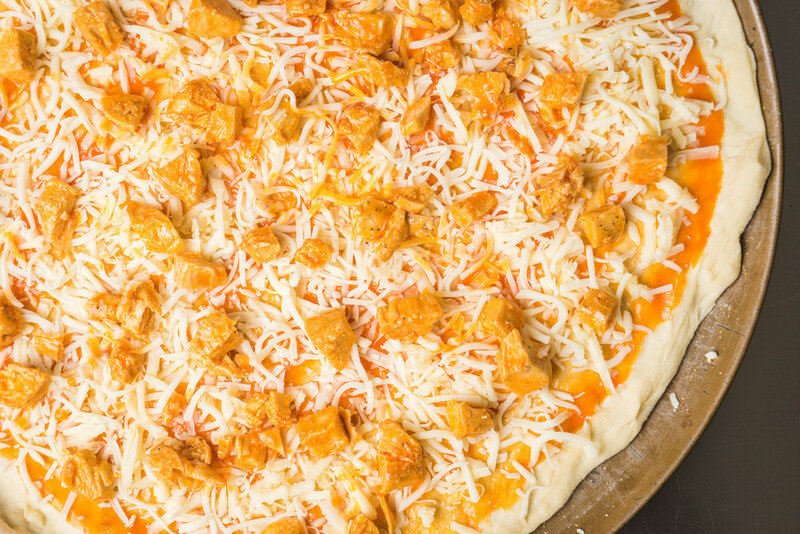 The mood for Buffalo and spice struck me one Pizza Friday so instead of skipping our official pizza night to tear into some boneless strips, I decided to toss Buffalo chicken ingredients on a pizza crust. And I’m glad I did! This tangy, spicy, cheesy pie begs for a fresh thin crust and cool Blue Cheese or Ranch dressing for dipping on the side. If you want to "health" it up, cut up some carrots and celery to dunk in the dressing:) This may be my favorite way yet to enjoy Buffalo chicken! Slice and serve up with cool Ranch dressing or tangy Blue Cheese dressing for dipping! I highly recommend using a from scratch pizza dough (like this one perhaps;), but if time is not on your side, a ready made crust will stand in just fine. We have always used Frank’s Red Hot original to make this; however, if you use a different type of cayenne pepper sauce, it should work fine. I will say I have never used the pre-made Buffalo Wing sauce that is sold so I am not actually sure what the outcome would be. You may not need to add any butter if you use this sauce. If you ever make this with the already prepared wing sauce, let me know how it turns out and what your thoughts are! If you like your Buffalo sauce more or less spicy, play with the amount of cayenne pepper sauce you add in. Too spicy? Melt a tablespoon of butter and add it to your sauce to tone down the spice a bit. Not spicy enough? Add more cayenne pepper sauce a tablespoon at a time until you reach your desired heat.